In chemistry, pH is a measure of the activity of the Hydrogen Ion. p[H], which measures the hydrogen ion concentration is closely related to, and is often written as, pH. 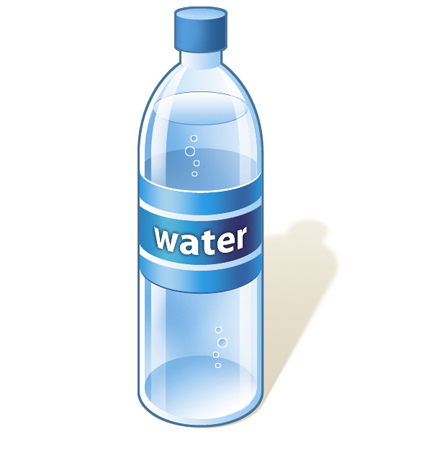 Pure regular water has a pH very close to 7 at 25°C. Solutions with a pH less than 7 are said to be acidic and solutions with a pH greater than 7 are basic or alkaline. Our state of health is a reflection of the pH level in our body. There are numerous books written on acid-alkaline balance diets, however, the list of diseases that attack us today suggests that most of us have become "too acid" accumulating acidic residues in our bodies due to poor nutrition, lack of healthy exercise, environmental pollutants and stress. Here is the importance of drinking alkaline water that can support the body during eating disorder and normal stress caused by the lifestyles that we practice today, eliminating harmful acidic residues and fatty cells. 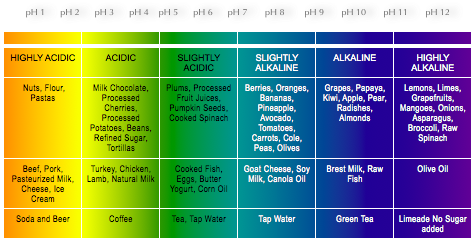 Click on the image below to see examples of Acidic and Alkaline Foods. Also known as redox potential, oxidation / reduction potential, ORP is a measure of the tendency of a chemical species to acquire electrons and thereby be reduced. Reduction potential is measured in volts (V), or millivolts (mV). When a the ORP is in the negative is Antioxidant and when is in the positive range it is Oxidant. Normal body processes - such as food, metabolism, breathing or exercise - produce free radicals, unstable and highly reactive molecules. Its natural action is to remove the electron they lack from the molecules that are around them for stability. The "attacked" molecules then become in turn free radicals. This begins a chain reaction that damages cells and breaks down cell membranes destroying and mutating their genetic information and paving the way to develop various kinds of diseases and our bodies will age. The effect of oxidation caused by free radicals is countered by providing antioxidants to neutralize them preventing their harmful action. Today, we know that vitamins C and E, beta carotene and selenium act as antioxidants releasing electrons in the blood which, when captured by free radicals, the molecules become stable. Alkaline water treated by electrolysis is a better solution because it provides a lot of free electrons that can block the disruption of normal cells as being a substance of low molecular weight and dynamism allowing to reach all tissues of the body in a very short time. Water molecules come in molecular structures. 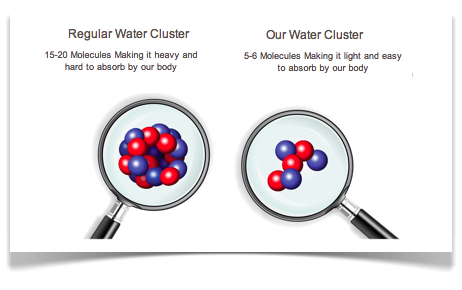 Tap water has large clusters (15 to 20 molecules per group). 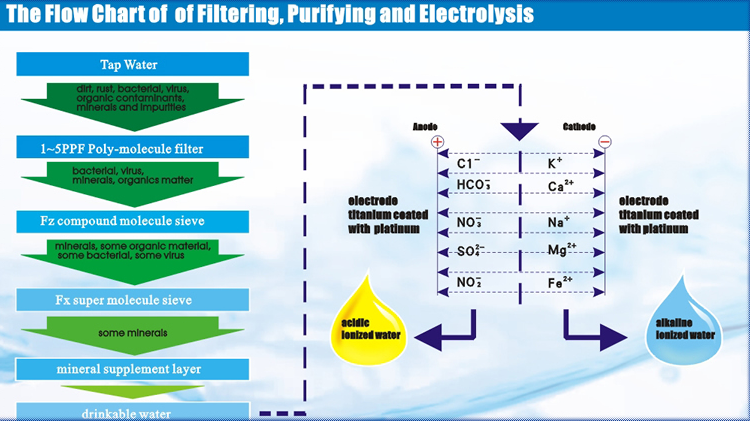 In our company we use electrolysis to reduce large amounts of water from its original size called micro-clusters groups (5 to 6 molecules of each cluster). The smaller the cluster size is more easily absorbed by what gives water excellent hydrating properties, high solubility and good permeability. Our water has a higher power of hydration than any other liquid, also has minerals that the body needs, such as Calcium, Magnesium, Potassium and Sodium. Electrolisis reduces salts, acids, chlorine and other minerals harmful to health.